Cycling by Numbers - Finding Your Way! It’s really easy. 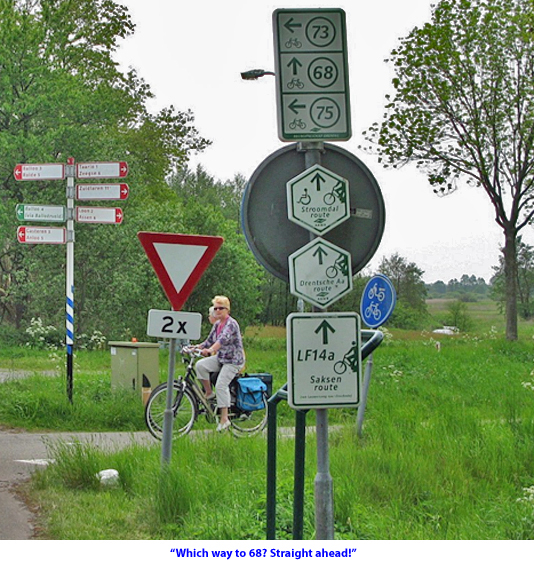 The Dutch have a brilliant system for navigating the cycling path network! Main intersections in the bike track network have been assigned a number. You’ll find them on the map we provide you with. At every numbered intersection there’s a big sign with a map of the surroundings where you can see where you are and what options you have, just like on the map that we provide you with. In the picture above, the bottom three signs refer to fixed routes. For our tours, we sometimes use a combination of cycling-by-numbers and fixed routes, sending you along short stretches of long-distance LF routes, for example. This works just fine because the two systems tie in nicely. You’ll also find written directions in your Route Pack. Why the Dutch don't wear helmets!